Quartet of espresso gelées: clockwise from top left are curry, lavender, star anise and fennel. It seemed like such a unique idea. After all, who would think to JELL coffee? Well, I’ll tell you who: other adventurous food-bloggers (as I write, THREE jelled coffees have already been posted by Santos, Joone and Barbara, and I thought that being in Europe I was ahead of the game!). I chose this recipe after realizing that I had senselessly squandered my all-time gelatin favorite for last month’s IMBB. I was tempted into trying jellied coffee by epicurious, who among all their gelatin-laden delights offered me this chance to combine COFFEE with CURRY, a pairing I never would have dared dream about, much less invent myself. Suitably intrigued by this unorthodox duo, I decided to branch out and not limit myself to one unexpected flavor combination, but FOUR. I mean if you’re going to do something, go ahead and do it right. Even if most of it ends up down the drain, at least your horizons will have been stretched that tiny little bit more. Coffee with CURRY: This was the original, and every single person who reviewed this recipe online said it was unexpectedly good (of course there were plenty others who unabashedly bypassed the curry). I must say I agree. The flavor of the curry is amazing subtle, and I would even go so far as to say it’s unrecognizable as curry. It just tastes like very intriguingly-spiced coffee. Used with restraint, this was my favorite of the lot. Coffee with LAVENDER: This turned out to be the most disappointing. I think lavender’s grassy, herbal flavor is better suited to pairings with fruity or creamy, rather than bitter. Coffee with STAR ANISE: I kept thinking of Thai coffee as I ate this, the kind that comes iced and tooth-achingly sweet. The combination of star anise and coffee was good; not quite as complex as the curry, but very fragrant and hauntingly exotic. A definite success. Coffee with FENNEL: This surprised me by how much I liked it. I thought fennel would echo lavender and clash with the bitterness of the coffee, but the opposite was true. Thinking about it, I realized that coffee and aniseed are old buddies (think coffee with sambuca, for example), and fennel and aniseed are very similar. Two thumbs up, and a nice complement to the other three flavors. Will I make it again? No doubt. It is unbelievably easy, the flavors are sophisticated and intriguing, and the recipe offers almost endless possibilities for experimentation. I wish everything I cooked was like this! And by the way, thanks to Elise for hosting this month’s event. Can’t wait to see the roundup! Soften the gelatin in 1/4 cup cold water for 1 minute. Combine with the espresso, boiling water and sugar in a large bowl and stir until the sugar and gelatin have both dissolved. If things have cooled too much by this point for this to happen, heat it gently in a saucepan until there are no granules left. Add the brandy (if using), and do one of two things: either spoon the mixture into individual cups or bowls, or else keep it all in one bowl, and then put it in the fridge to chill for several hours. In the meantime, using a clean coffee grinder grind the lavender, star anise and fennel separately. Reserve. When the gelées have set, whip the cream with the sugar or honey. Separate the cream into four bowls; into each portion fold in one of the reserved spices. If you’ve chilled the gelée in one bowl, spoon it out now into individual cups or bowls. 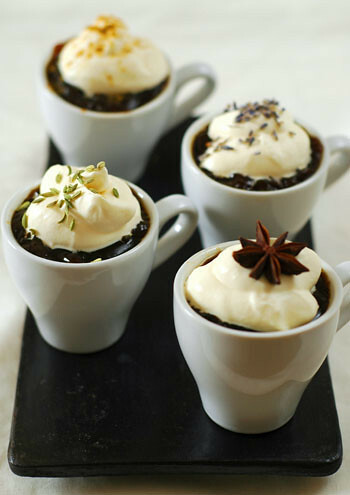 Top each portion of gelee with one spoonful of each of the differently-spiced creams. Or you could serve four communal bowls contianing the gelee and different creams, and let people help themselves to the flavors they like. Note: I was really impressed with the flavor possibilities of this simple dessert. I can think of many other traditional and nontraditional flavors I would like to try here: lemongrass, cardamom, chili, grapefruit, rosemary, ginger, saffron – basically anything with enough punch to stand up next to the dark, malty espresso. brava! i see i am in wonderful company 🙂 i love your demitasse cups, and each variation seems to have its own personality. i wouldn’t mind trying all of them. Hi Melissa – These look beautiful! I never would have thought to add a curry flavor to coffee. Will have to try that sometime. You got me at lavender… I am so nuts for that flavoring! Beautiful post and interesting idea to jell coffee–heck! I would have never thought of it! Hi Keiko – a complement from you on the photo is highly valued indeed! I’m interested to learn that jellied coffee is popular in Japan. I’ve become really fascinated with the intricacies of Japanese cuisine lately thanks to blog-reading – I never realized there was so much beyond sushi and sukiyaki!Hi Santos – I thought the demitasse cups were a great idea too and was entertaining thoughts of serving little ‘jelled espresso variations’ at my next dinner party – that is, until it hit me that I would need to own about 50 of them to make that possible!Hi Elise – thanks for your *fantastic* roundup and your lovely comment! These events help us all to open up some new culinary doors, don’t they?Hi Rowena – yes, lavender and I are becoming very good friends indeed. I’m having loads of fun thinking of all kinds of strange new places I can put it – lavender pancakes, lavender milkshakes, lavender BBQ sauce(! )… What do you love it in? These are really quite beautiful looking! Your flavor combinations remind me of the wonderful chocolates at Vosges!PS how about making a lavender liquer (and adding that too lemonade)? or lavender vodka martinis? Melissa, these are glorious, and so original. What a lovely blog you’ve created! I’m having a great time reading it. What a lovely interpretation of the IMBB! The curry coffee is definitely intriguing, reminicent of masala chai (chai tea), but with much more depth. The presentation is adorable! Hi McAuliflower – I’ve never actually had chocolates from Vosges, but I’ve heard plenty about them. I didn’t think coffee would be quite as versatile as chocolate, but it obviously goes with a lot more things than I imagined! And great tips with lavender in cocktails – I never thought of that!Hi Julie – thanks for stopping by! You have a lovely blog too, I might add!Hi Tara – When I first found the recipe I briefly considered making it chai spices instead of curry, but my curiosity won out and I stuck with curry. I think a chai blend or garam masala might be a good alternative for slightly more sensitive palates – don’t know if I could get away with serving coffee and curry to my grandmother! Lovely! I can’t wait to make these. I’ve been experimenting with dark chocolate and spices — next time I will definitely try the coffee version. Great post and photos as always! Hi Melissa,These look absolutely delicious. Perfect for the warm days ahead, wouldn’t you say? I think I’d like to try the one with either curry or star anise. Great photo…and great job! Off the top of my head – Lavender Creme Brulee! I too thought coffee jelly was kind of a wierd idea until I tried it (it was one of my jelly trios for IMBB). I think I prefer your adaptation as the chocolate cream centres in mine were quite rich.I love the curry combination, although I’d probably pass on the anise and fennel as I am not really a liquorice fan. Lyn, I thought your chocolate cream idea was fantastic – I thought about adapting this to look something like that, so layers of jellied coffee (preferably at gravity-defying angles) interspersed with layers of jellied curry… If I hadn’t already tried it I would probably be cringing at the mere thought!